Tinubu said this on Saturday at the APC’s presidential rally in Lagos. President Buhari had arrived Lagos for his campaign where both current and former governors of the state, Ambode and Fashola were equally present. 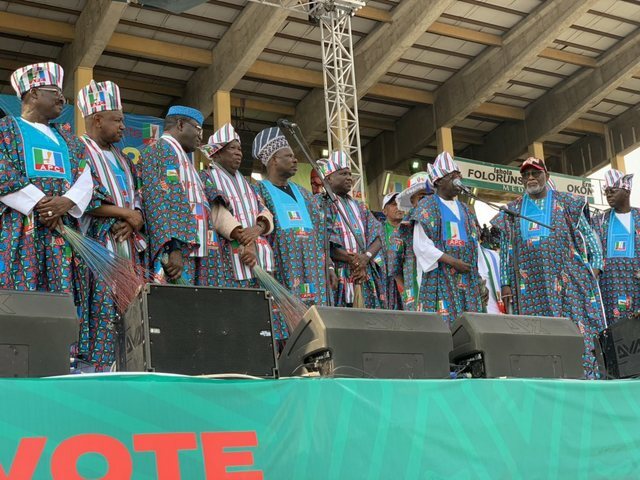 Tinubu, who assured that Buhari will win Lagos state in the coming election in the country, however, attacked the former President of Nigeria, Olusegun Obasanjo and the Presidential candidate of the Peoples Democratic Party, PDP, Atiku Abubakar, saying both men should be held responsible for the poor electricity in the country. Taking a swipe at Obasanjo and Atiku, Tinubu said the former president was responsible for the epileptic power supply in Nigeria because, both Obasanjo and Atiku opposed the novel power generation project he introduced in Badagry. He however, said that he later won them in court and continued with his power project. According to him, “Then, Obasanjo came. We taught them that there was no other way to have business evolution and revolution in this country without steady power supply. On Peter Obi, he said, “And they call one man Obi, in one party, saying he will create jobs. He has not been able to tell us how we can make brake parts for those vehicles, how we can make wheel spanners on our own for those vehicles.